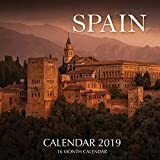 Below are some calendars with pictures of Spain, or Spanish themes. Hola! 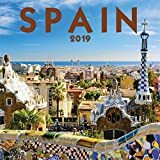 National Geographic Spain 2019 takes you on a tour of Spain's diverse landscape, over scenic mountains, through quaint villages, and across the sandy beaches of the Mediterranean. Discover centuries-old architecture under the warm Spanish sun. This collection of photographs truly captures the vitality Spain is known for. Sites visited in this year's edition are: Basilica de la Sagrada, Barcelona; Ainsa, Pyrenees; Menorca, Balearic Islands; Alhambra Palace, Granada; Galicia, Ponteverda; Church of Santa Maria del Manzano, Burgos; Monte Perdido National Park, Aragon; Aran Valley, Lleida, Catalonia; Alcazar de Toledo; Castle of Loarre, Huesca, Bermeo, Biscay, Basque; Baelo Claudia, Cadiz, Andalusia. Each outstanding image is accompanied by a large grid with moon phases and international holidays. National Geographic supports vital work in conservation, research, exploration, and education. This calendar includes a 3-year at-a-glance page and is earth friendly, printed with soya-based inks on FSC certified paper. 13 x 12 inches (opens to 13 x 24 inches). 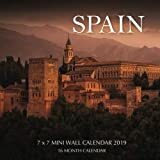 Fill your upcoming 2019, with 16 months of Spain all year round. This beautiful calendar contains 16 months and 3 mini 2018, 2019, and 2020 year calendars. Fill your upcoming 2019, with 16 months of Spain all year round. This beautiful mini calendar contains 16 months and 3 mini 2018, 2019, and 2020 year calendars. 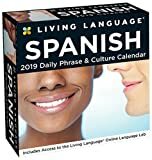 This all-new Living Language: Spanish 2019 Day-to-Day Calendar guides you through the Living Language experience with a new word or phrase each day, alongside its English translation and pronunciation aids. For over 65 years, Living Language® has been a proven and effective language-learning experience. The Living Language approach builds on a foundation of essential words and phrases, developing practical language skills to equip beginners and practiced learners alike. Also included are cultural pages focused on culturally significant events throughout the year for Spanish-speaking people. Plus, you’ll receive access to the Online Language Lab, providing interactive content to help you practice and learn more. 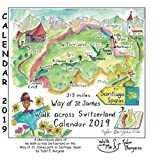 Sketchbook diary of my 315 mile hike across Switzerland on the Way of St. James pilgrim path going to Santiago, Spain. I hiked solo, turned 66 on the trail and completed 315 hilly, silly miles in 26 days. Met wonderful people, saw beautiful scenes and ate great food. I love being a pilgrim!